Treadfit opened on Monday at 10326 S. Western Ave. in Beverly. The new gym combines treadmill exercises with strength training. It's aimed at runners of all types. BEVERLY — Attention runners: Treadfit wants to replace your midweek training run. The gym, which opened on Monday at 10326 S. Western Ave. in Beverly, combines an intense treadmill workout with strength training. The high-intensity workout takes about 50 minutes. It includes both sprint and incline work on the treadmill along with weight lifting, core strengthening and flexibility training on adjacent mats. Jennifer Harkins, 41, of West Beverly, is the owner of Treadfit. The longtime runner and mother of five developed the program from both her love of running and lack of time. "I have been running since I was 15, so more than 25 years," Harkins said Monday. Harkins has run five marathons, and she often entered the races injured or knowing that she skipped the recommended strength training and sprint work headed into the 26.2 mile race. "As I got older, I realized I needed more strength," she said. Treadfit aims to give runners the necessary strength training and speed work ahead of a big race. For those training for a marathon, she said the workout ideally replaces one of the two weekday runs. These shorter runs are typically followed by a long run on the weekend. But Harkins said Treadfit's combination of interval training on the treadmill and strength work also stands on its own. Beginner runners — perhaps those looking to complete their first 5K — also stand to benefit from her training regimen as would half marathon participants looking to set a new personal record. "It's for everybody that can move," said Colette Fitzgerald, a longtime personal trainer in Beverly. 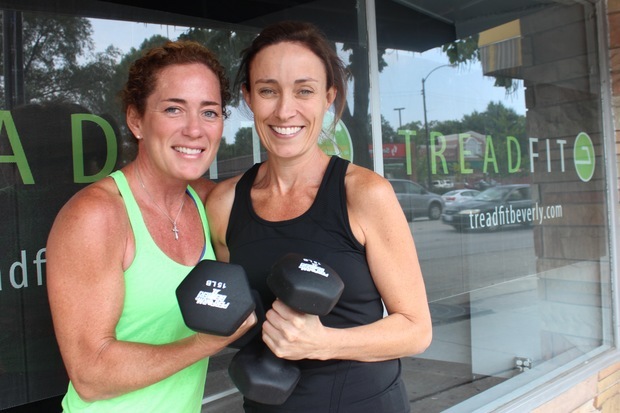 Fitzgerald and Harkins will teach courses at Treadfit along with Amanda Morrell of suburban Oak Lawn. Classes cost $15 each but the cost drops to $11 per class for those who sign up for a 20-session package. Workouts are estimated to burn between 400-800 calories per class, and instruction is offered six days per week. Harkins said she'll add more classes as the sessions fill up. Erin Healy Ross, of Beverly, was among the first to try out the new gym on Monday. Ross is also the executive director of the 95th Street Beverly Hills Business Association. "I love the Treadfit workout because it makes me push myself harder than I would if I went out on a run by myself. The combination of treadmill work and floor work makes for a great experience," Ross said. While Harkins said Treadfit's exercise program is her own design, similar facilities combining treadmill workouts and strength training have begun to pop up. Shred415 has six locations in the Chicago area and a gym in St. Louis. Orangetheory Fitness is a Fort Lauderdale, Fla.-based chain that combines treadmill and rowing machine workouts with strength training. The franchise is on track to open 600 studios by 2017. But Harkins doesn't believe the combo workout is part of a trend. Rather, she believes running has become increasingly popular, and Treadfit aims to help both new and experienced runners by giving them a chance to improve. "With Treadfit, you are getting in a great run, but you are also getting the strength training," she said.